The 2018 event grossed over $71,125, money that will be given to ResourceWest and the ICA Food Shelf in support of their programs that help community members in need. People from across the area flocked to the Hopkins Center for the Arts on Tuesday to have their fill of hot soup and show their support for the 20th-annual Empty Bowls fundraiser. This year the event raked in $71,125 in donations that benefit ResourceWest and the ICA Food Shelf. Of the donations, roughly $48,000 was collected by the “Soup-er Supporters,” which include the Minnetonka Rotary and 150 businesses and civic organizations, and city, school, and community leaders. 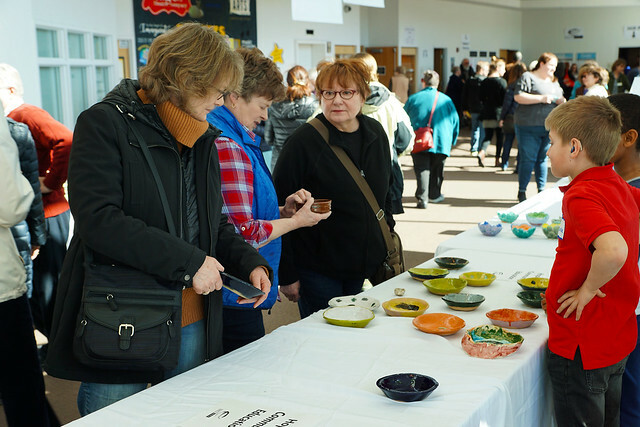 The all-day event had on display glazed bowls created by Hopkins staff and students, community members, and local potters, and served up a variety of soups donated by local restaurants and Hopkins Royal Cuisine. This fundraiser is an important initiative that helps fill the empty bowls in our community. And since 1999, art students and community potters have created hundreds of uniquely designed bowls and raised over $1 million for those in need. Learn more about Empty Bowls. Don’t forget to save the date for the 21st-annual Empty Bowls at the Hopkins Center for the Arts. We hope to see you on March 12, 2019!